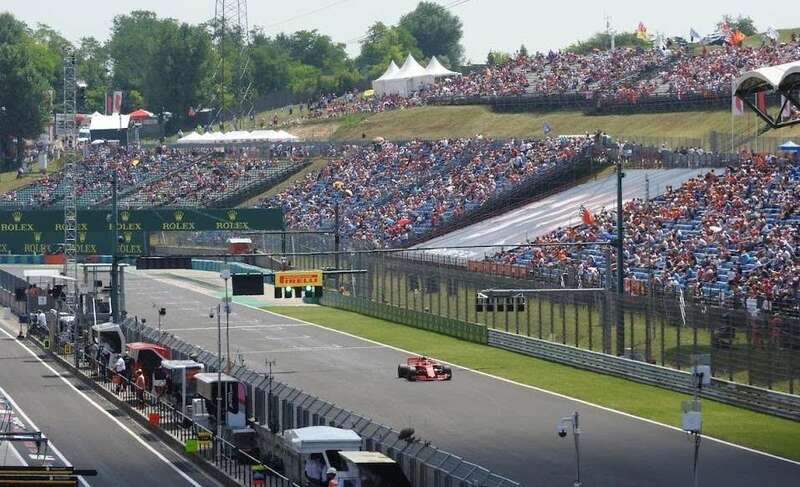 Advice on getting to Budapest and the Hungaroring circuit for the 2019 Hungarian Grand Prix on August 1-4. Budapest benefits from a convenient location in the heart of Central Europe. Whether you fly, take the train or drive yourself, it’s easy to get to the Hungarian Grand Prix in July. Budapest has a well-developed public transport network with an efficient three-line Metro serving most central parts of the of the city. Taxis are plentiful and new regulations have largely eliminated dishonest drivers. 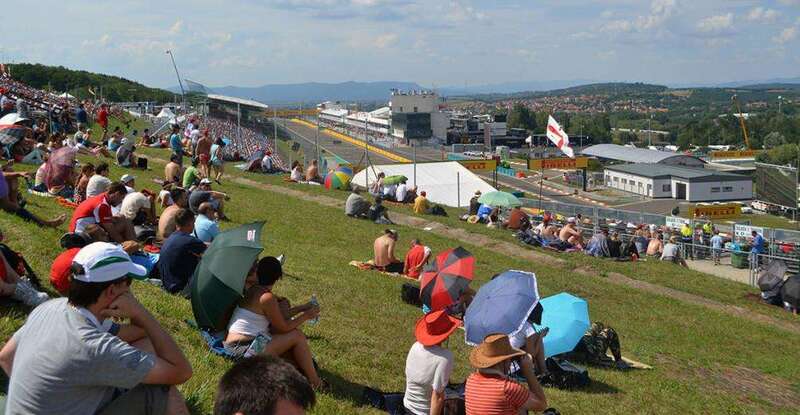 The Hungaroring circuit is 20km to the northwest of the center and can be reached fairly easily by train, bus or taxi. Budapest Ferenc Liszt International Airport (BUD), 16km South East of the city center, serves a range of European and long-haul flights. Hungary’s national flag carrying airline, Malev, collapsed under crippling debts in 2012, which reduced some of the long-haul destinations served from Budapest. More successful is the Hungarian budget airline, Wizz Air, which is based in Budapest and flies to a large number of European destinations and also further afield. Other budget carriers flying to Budapest from numerous European destinations include EasyJet, Ryanair, German Wings and Jet2. Major European flag carriers also regularly fly direct to Budapest including British Airways, Air France, Lufthansa, LOT, Turkish Airlines and Aeroflot. You could into Vienna or Bratislava if you want to see more of the region and potentially save a few Euros; both cities are just a few hours from Budapest. Take the 100E or 200E bus from the airport to the city. More info here. Trains also depart from the Ferihegy at the airport to Nyugati on a regular schedule. More info here. An official Főtaxi airport taxi from the airport to central Budapest should cost around €25. Beware of unlicensed taxis at the airport. There’s also the miniBUD airport minibus, which offers affordable door-to-door services. Look for the desk in the arrivals hall. If you have a little more time and want to see some of the countryside, taking the train to Budapest is a great choice. The city is well connected to Europe’s extensive rail network and there are day and overnight trains available. Seat 61 is a great source of information on trains to Budapest. You can book online via the Hungarian rail company, Mav Start. Here’s some routes, journey times and one-way ticket prices: Vienna or Bratislava (3 hours), from €19 / Prague (6 hours), from €19 / Munich (7 hours) from €29 / Krakow (10 hours), from €49 in two-bed sleeper / Berlin (12 hours), from €39. On a budget? Regular buses connect Budapest with many Western, Central and Eastern Europe capitals, even as far afield as the UK. The main international bus station in Budapest (Népliget) is close to the city centre and on the Metro. Check out Eurolines or Orangeways for more information and to book tickets. Here’s some routes, journey times and one-way prices from Orangeways: Bratislava (2.5 hours), 4000 HUF (€13) / Vienna (3 hours), 3200 HUF (€11) / Prague or Krakow (6-7 hours), 6000 HUF (€20) / Berlin (12 hours), 9000 HUF (€30). Depending on where you are staying and your chosen mode of transport, the 20km trip from Budapest to the Hungaroring will take you anywhere from 30-90 minutes. If a helicopter transfer is beyond your budget, then the next most effective way to get to the track is via taxi, which only takes 30 minutes but costs €40 each way. Alternatively, if you don’t mind a trip which takes more like 90 minutes and involves at least 30 minutes of walking, then you can take the free bus or the cheap metro/train option. Taking the metro/train to the Hungaroring will take anywhere from 60-90 minutes, depending on where you stay in the city. The last 30 minutes involves a cross country walk to the track. Follow these instructions. Take the metro to the last station on the eastern end of the red metro line (M2), Örs vezér tere. If you are staying near a station on one of the other metro lines (M1 or M3), you will have to change for an eastern-bound M2 train at the main central interchange station, Deák Ferenc tér. It’s only 6 stops from Deák Ferenc tér to Örs vezér tere which should take around 15 minutes. Once you have reached the end of the M2 line at Örs vezér tere, exit the station and cross to the opposite corner of the intersection (via an underpass), where you will find a small suburban train stop. A ticket office is nearby and there is also a large shopping center (a good place to stock up on water and snacks). Trains only go in one direction from here, as it’s the end of the line – you need the train to Gödöllő. Tickets cost 250 HUF each way (less than €1) and trains run regularly on Grand Prix weekend. You can purchase your ticket before you get on the train or buy from the conductor after you have set off. The trains are pretty old and rickety, but the trip to the special Hungaroring stop (only used on race weekend) only takes around 25 minutes. You can get off one stop earlier at Szilasliget or one stop later at Mogyoród as the walk to the circuit is a similar distance. After you get off the train, it’s a 30-40 minute cross-country walk to the track. Just follow the crowds, you won’t get lost. Taxis are available if you don’t fancy the walk, but make sure the driver uses the meter or agrees to a reasonable fare upfront. Be patient if you are using the train to get home on Sunday after the race; the trains can become very overcrowded at peak times. The organizers put on free buses to the circuit from central Budapest on Grand Prix weekend. As long as you have a valid ticket for the race, you can take the bus. The buses leave from Stadion autóbusz-pályaudvar. The closest metro is Puskás Ferenc Stadion on the M2 (red) line, four stops east of Deák Ferenc tér. The bus takes around 45 minutes, but doesn’t actually get you to the circuit proper. You will get dropped off in nearby Mogyoród (Templom tér), which is about 40-minutes walk from the circuit. The service is pretty orderly and hassle free for most of the weekend, but don’t be in a hurry to leave the circuit after the race. Stay a while to let the crowds die down. A timetable for the buses will be available closer to race weekend on the Hungaroring website. Click here to hire a car with our partners Rentalcars. The Hungaroring is located just off the M3 motorway which heads northeast out of Budapest. Don’t forget that you will need to buy a vignette to use the motorway; a weekly pass costs around €10 and can be purchased at service stations. There is a 0% blood alcohol limit for driving in Hungary – do not drink and drive. 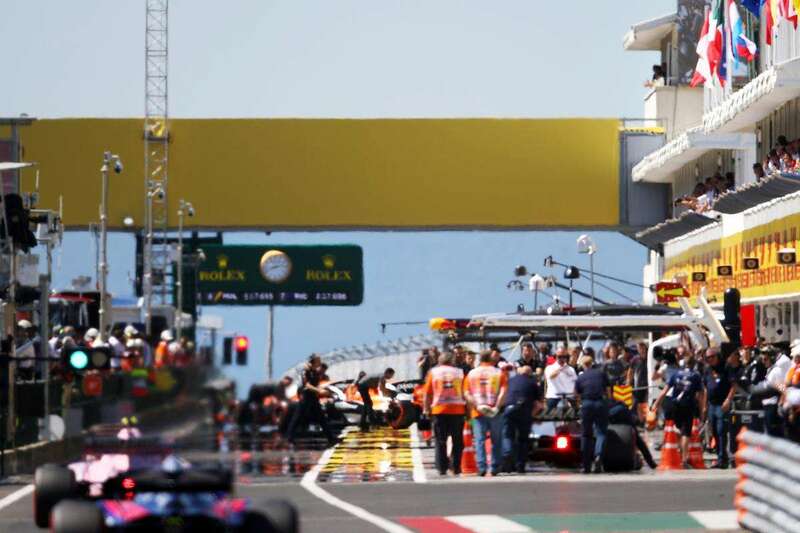 Access to the circuit is well signposted and the drive from central Budapest should only take around 20 minutes, but be ready for traffic delays, particularly when leaving the circuit on Saturday and Sunday. The roads around the circuit are narrow and were not designed to handle the volume of traffic the area experiences on Grand Prix weekend. Trackside parking is free for ticket holders. Check the attached map for circuit access roads and parking locations. Note: if you have purchased a minimum of 4 Super Gold tickets, then you are entitled to park in a special parking zone within the circuit, close to your grandstand. Taxis used to be a bit of a lottery in Budapest, with a big variation in rates between companies and lots of drivers out to fleece tourists. Luckily, things have improved since September 2013, when a new law came into force which regulates taxi fares. There is a new fixed tariff of 280 HUF per km ( €0.95/km) in addition to the one-off basic fee of 450 HUF ( €1.50. Look for licensed taxis (normally yellow) which have a clearly identified price list on the window. The metro is a great way to get around the city, and there are also trams, trolley buses and regular buses. If you are planning on using a lot of public transport when you are in town, it makes sense to purchase a travel card which is valid for either 24, 48 or 72 hours. There are two types of card to choose from: Budapest Travelcard, which is good for unlimited journeys on all forms of public transport within the city limits. Valid for 24 hours (1650 HUF / €5.50) or 72 hours (4150 HUF / €13.70) OR Budapest card, which offers the same benefits as the Travelcard, but also includes extras such as free entry to museums and the famous Szent Lukács Thermal Baths as well as lots of discounts. Valid for 24 hours (4500 HUF / €15), 48 hours (7500 HUF / €25) or 72 hours (8900 HUF / €30). Single tickets on public transport cost 350 HUF (just over €1) and you can also buy a book of ten individual tickets for 3000 HUF ( €10). Don’t forget to validate your ticket as the public transport inspectors in the city have a fearsome reputation and have been known to shake down tourists. More information about public transport in Budapest. Been to the Hungaroring? Leave a comment with your travel tips. I have found on the internet that folding chairs are not allowed on the general admission site. Are there any other restrictions on what I can bring with me, like camera, food, drinks (including alcohol)? No animals will be admitted to the venue or any car parks. The following articles must not be brought within the venue – knives, fireworks, smoke canisters, air-horns, flares, weapons, dangerous or hazardous items, laser devices, bottles, glass vessels and any article that might be used as a weapon and/or compromise public safety. Any person in possession of such items will be refused entry to the venue. Personal electronic devices, including still image cameras/mobile telephones/other handheld personal communication devices are permitted provided that any images/films/recordings/data that are created/recorded/stored thereon are used for personal/private/non-commercial use only. Where do you get a taxi to return back from the circuit? Do you have to pre book? Hi Gary, there’s an official taxi stand near the Main gate (close to turn 1, Gate 8). You don’t have to pre-book, but you may have to wait a little longer at peak times, like right after the race. You should pay around 30-40 EUR to get back to the center after the race. How long a wait should I expect for a taxi right after the race? Hard to say really, but shouldn’t be longer than an hour. Don’t hold me to that as the crowds at Hungaroring have been getting bigger in recent years! We went in 2018. It took us 45 minuets to get out of the circuit and had to queue for about 3 hours for a taxi!! When we left the queue was still at least 2 hours long. There were not coaches that we could see apart from organised trips. Also get there early as the roads are gridlocked. Our taxi was diverted by the police to the opposite side of the circuit and we had a 40 minute walk to the main entrance. Went to 2018 race, official taxis both times cost 80€ from centre and 92€ to. Quite expensive. However drink and food well below what I’d pay in Ireland. hi.im taking my elderly father to hungaroring next year,which area is easiest to enter and exit. was looking at bronze 2. we will probably have a hire car. Hi Dave, there is parking between entry gates 2 and 3. Both of these are close to Bronze, so not much walking. Shouldn’t be a problem driving a hire car on Friday and Saturday, but I would recommend taking a taxi on race day. hi will bronze tickets give you access to general admission area aswell ? Hi Dave, the answer is yes! I have 2 Silver 1 tickets this year ( 2018 ). If I drive, do I get any specific places to park with these tickets or is it every person for themselves ? Do you think taking an 8pm train on the Sunday after the race from Budapest-Keleti train station is possible? Should be fine for the train. I would say later for a flight, but you won’t have so much security etc on the train. Hi Peter, I think you will be ok. Definitely I don’t recommend flying before 8pm after a race, but I think you will have enough time to get to the airport in Budapest – even with delays leaving the circuit after the race. i just book my general admission tickets for Hungaroring!!! any tips where to sit in Sunday for good view? Yes, lots of good places. I like the hill behind the final corner, where you can see a big section of the track. 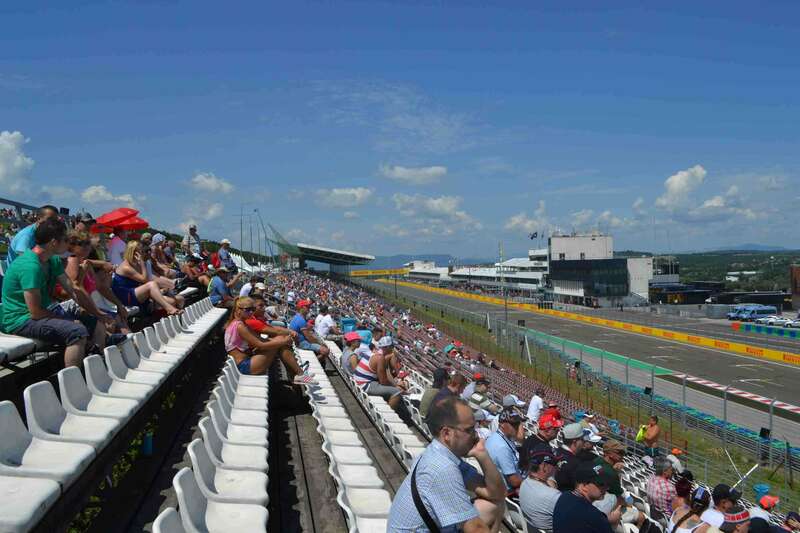 Check our Hungarian F1 Tickets post, more advice there. Hi Carla, maybe you want to check out the waterpark that’s right near the circuit. I’ve never been, but it’s always hot in Hungary on race weekend, so could be a good idea to spend a few hours away from the track. My experience with the pit walk was that there was too many people and it got pretty overcrowded, especially if you wanted to see drivers etc. Still worth doing, but you’ve been warned! Thanks for the advice! Water park is definitely on the cards! !Getting excited! Hi Carla, I’d say general admission is the best place for your kids. Lots of room to walk around, elevated grassed areas with good areas of the circuit. I watched Daniel Ricciardo win in 2014 from the GA area at the Hungaroring, great views and great memories. And you can go on the circuit at the end of the race from the General Admission areas! A question on how to get to the Hungaroring. Is it possible to go there by bike? I guess, depending on where you come from! It’s about 20km from the center of Budapest to the Hungaroring, and there are some hills. There shouldn’t be any restrictions about cycling to the track, but I’m not sure where you can safely park your bicycle. It would not surprise me if that option was also available for the rest of the weekend (or if other places to put a bike are available later in the weekend), but as I’ve never used it, you should probably ask someone who knows more about these things than me. If I purchase a travel card is it valid for travel to hungoring? Only for Metro and city buses. To take the train to the Hungaroring from Örs vezé, you need a separate ticket. The website for the Budapest Card says it includes free HEV (suburban train) travel to the Grand Prix. I would leave your car at the hotel on Sunday. Get a taxi after the race from the circuit back to Budapest, then drive to the airport. Taxis are quicker to leave the circuit, as they use a special road. First time on Grand Prix and I have Bronze 1 ticket. Is gate 2 (which is near one to Bronze 1 stand) easily reachable from main gate (since probably my transport will stop here), how much “walk” is needed from main gate to gate 2? How long do you estimate is the exit time (in Hours) by car after the race on Sunday, if we park in the area of the Bronze zone ? I have 2 super gold tickets for the weekend. I also have a disabled card. Where can i park best. I see gates 6 or 7?? Hi Hans, I suggest you contact the circuit. I believe you will be able to use parking right next to La Source if you have a disabled pass. Hello Andrew, I am so glad i found your website. This will be the first time for me to experience F1 in Hungary. What time should i arrive on the race day to get myself a good seat for general admission? Thanks million. There is still plenty of room in General Admission, but for a good spot I would say by around 9 or 10am if possible. Hello! I’m looking at the various ways of getting to the Hungaroring this weekend. I saw your link about the free buses but the Hungaroring timetable page doesn’t seem to show that specific bus stop you mentioned. So I just wanted to check it hadn’t changed? FREE OF CHARGE BUS TRANSFER (27–29 JULY 2018) Hungaroring Sport Plc provides all passengers bearing a valid Formula 1 ticket with the following bus services, free of charge: Budapest, Árpád bridge, Bus Station – Mogyoród center Mogyoród center – Budapest, Árpád bridge, Bus Station Mogyoród, Local railway station (HÉV) – Mogyoród center Mogyoród center – Mogyoród, Local railway station (HÉV) FOR THE TIMETABLE PLEASE VISIT THE WEBSITE http://WWW.HUNGARORING.HU IN JULY. Can you explane to me where I can find the timetable of the free of charge bus, I can’t find it on the site https://hungaroring.hu . Hello! I have a ticket Bronze and I think to go by car, until what time is it possible to find free parking on Sunday morning? Try and leave as early as possible. There should still be free spaces, but get there before 9am if possible to beat the traffic. For those who have never been to Hungaroring before…. some tips and warnings…. 1. If you are at the circuit before the gates open, you will be given a limited number free pass to the pre-paddock entry area behind the pits. This is well worth it for meeting/seeing drivers, pundits etc on each day. Fri & Sat are best. 2. It is blisteringly hot and this year is no different. All usual warnings apply. 3. Do not be misled about transport getting to/from the circuit on Fri & Sat. You have been warned…. leading to…. 4. Hungaroring is, in my experience, one of the most chaotic circuits to leave on race day. Do not be fooled by the ‘bus’ and ‘train’ schedules. It is an absolute free for all, with hundreds of people attempting to board. The taxi service descends into near chaos on Sunday. The easiest way of getting round the inevitable 2 hours queues is to pair up with another 2 or 3 ppl if you are going back into Budapest. There is a queue for couples/3 ppl, but, there is also a Q for groups i.e. 4 and over. This is MUCH shorter and highly advisable. Last year we saw a number of people with heat exhaustion outside the circuit. Again – you have been warned. Hope this helps folk with their first trips to the Hungaroring. Hi, trying to get to the Hungororing today for the pit walk. There are no buses from Arpad bus station even though all the info points us there. Getting worried now as to getting to the circuit tomorrow Friday for free practice – please can you give any help as starting to get desperate and cannot walk much further!!! Hi Kat, sorry but the station where the free buses leave from has changed this year. It’s now Stadion autóbusz-pályaudvar. More details and timetable is here. Hi, we have bought four supercgold tickets for all three racingdays. Do you know where and if we can use special parkingplaces and how to find it. Hello Hanna, please check the map here (the yellow VIP parking). You should be able to use the spaces, but I don’t know if you are supposed to have a special permit or you just show your tickets. Is the VIP lane reversed after the race? Ie if I have a VIP parking pass can I use a VIP lane after the race? I guess the travel advice above still applies (though I assume the special Hungaroring train stop or free bus aren’t options for the testing?). Would appreciate any advice. Many thanks. Can i get a good view from general admission behind silver 2 tribines? Important update! There is a free shuttle now from mogyorod station (H8 Line) to a bus stop nearer to the track. You no Longer need to walk 40 mins (which is actually more like an hour). I learnt this the Hard way. We walked about 1.6km from the train station to the coop Super market and decided to take Taxify due to being not sure if we are walking in the right direction. Furthermore we didn’t have any crowd to follow. Weather was coming in to add to that. Google maps was showing a totally different route. first of all – it was great to meet you during the paddock visit and pitlane walk as a part of F1 Experiences package on Friday evening :) Greetings from my dad as well! To add my 2 cents to the discussion, I can recommend staying at Aquaworld Ramada hotel in Dunakeszi district, which is located less than 10 kms from Hungaroring and is well-accessible from the racetrack with M3 and M0 motorways. Apart from great location, the hotel features lot of pools and leisure facilities to cool down after a hot day at the track – which you can be sure of during July in Hungary ;) It is a 4* venue, but you can get a decent price if booked in advance for three-night stay – we paid 200 Euro per night, for double room with breakfast and buffet dinner included. Great to meet you and your father Pawel, and thanks for the hotel tip! Official Ticket Agent for Hungarian GP is GPTicketshop.com. We work with Gootickets.com and they are also legitimate, as well as Tickets.F1.com, but the latter have higher prices. 1. What is the best way to get to the circuit regarding hours of waiting? the train or the free bus? I have a Three corner silver one ticket! 2. Is it true that on Thursday we can have a pit walk on the circuit with those tickets? I’d say the train is better for leaving at the end of the race, less queues than bus. But better than both is taxi, if you can afford to pay a bit more. Yes, there is a pit lane walk on Thursday. More info in Trackside.